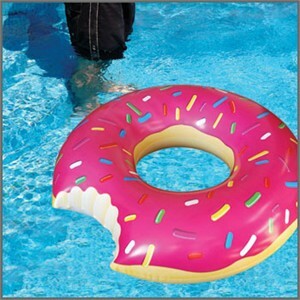 Have fun in the sun with the gigantic inflatable Donut Pool Float! At a massive 4 feet across, this isn't your baby sister's pool floatie. This is a seriously delicious pool floating experience, complete with sprinkles. Any flotation device that isn't shaped like a food item just blends in with the crowd. Look like a champion floating along in this hysterical Donut Pool Float. Stay dry and delectable with this funny gift. Nothing is sweeter for summer. Note: Not to be used as a life saving device. Not to be eaten. Availability: This Giant Donut Pool Float ships within approximately 1 business day.